A pacemaker is a small device that helps your heart beat more regularly. It does this with a small electric stimulation that helps control your heartbeat. Your doctor puts the pacemaker under the skin on your chest, just under your collarbone. It’s hooked up to your heart with tiny wires. You may need a pacemaker to keep your heart beating properly. This helps your body get the blood and oxygen it needs. Some people just need a pacemaker for a short time (like after a heart attack) and may use a kind that’s outside the skin. The battery unit for this type can be worn on a belt. Your heart beats too slow or too fast. Your heart doesn’t beat regularly. There’s a block in your heart’s electrical pathways. A pacemaker uses batteries to send electric signals to your heart to help it pump the right way. The pacemaker is connected to your heart by one or more wires. Tiny electric charges that you can’t feel move through the wire to your heart. Pacemakers work only when needed. They go on when your heartbeat is too slow, too fast or irregular. How do I live with my pacemaker? Check your pulse and keep a record of it the way your doctor tells you. Your doctor will check your pacemaker every three to six months. The battery in your pacemaker should last five to eight years or longer. When the battery runs down, you will need surgery to replace it. Take your medicine the way your doctor tells you. Tell your doctor if you have trouble breathing, if you gain weight or get puffy legs or ankles, or if you faint, black out or get dizzy. Follow all doctor’s instructions and keep your appointments. Carry an I.D. card with you so others know you have a pacemaker. Tell your other doctors and your dentist that you have a pacemaker. 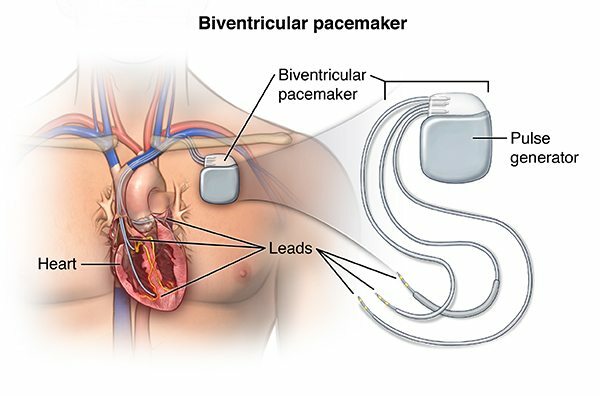 Certain types of medical equipment may affect how a pacemaker works. Tell airport security that you have a pacemaker. Household microwaves, electric appliances, most office and light shop equipment will NOT affect your pacemaker. If you work around industrial microwaves, electricity, cars or other large motors, ask your doctor about possible effects. Can I use a cell phone or microwave oven if I have a pacemaker? Microwave ovens, electric blankets, remote controls for TV and other common household appliances won’t affect your pacemaker. You can use a cell phone, too, if you take these steps: Hold the phone to the ear on the side of your body opposite from your pacemaker. When your phone is on, try to keep it at least six inches away from your pacemaker. For example, don’t carry your phone in your breast pocket over your pacemaker. Do I have to take it easy? Most people with a pacemaker lead full lives. You can participate in physical activity when your doctor says so. You will probably be given an exercise stress test so the doctor will be able to tell you how much physical activity and what kind of activity is safe for you. Many pacemakers allow for increases in pacing rates with exercise.